The Rebel Sweetheart. 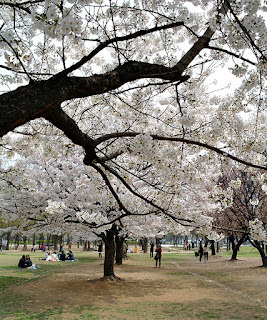 : Seoul Searching | Where to Find the Cherry Blossoms. Seoul Searching | Where to Find the Cherry Blossoms. It's the first day of April, and spring is definitely in the air. At least in South Korea, it is. I keep seeing photos of cherry blossoms in social media sites and spring festival announcements here and there, which makes me all the more excited for our next trip to my other motherland! They say Spring is the best time to visit South Korea. The biting cold has gone to be replaced by slightly warmer weather, the frost and ice have melted away, and the barren landscape transforms into a sea of green, with lush foliage and gorgeous flowers blooming into life. One of my lifelong dreams is to see these famous cherry blossoms up close and personal, and now I finally have the chance to do so! I even made a list of the places where I can most likely find those cherry blossoms, which you can find below. Located in Gwangjin-gu, Seoul, the Children's Grand Park is an ultimate leisure facility for families. Aside from the rows of giant cherry blossom trees that make the park vibrant and colorful, the place also boasts of a zoo, a botanical garden, amusement facilities, and even sports facilities. Another cherry blossom viewing hotspot is the Seoul Forest, located in Seongdong-gu, Seoul. As Seoul's answer to New York City's Central Park, Seoul Forest serves as a pleasant respite from the endless rows of skyscrapers and high-rise apartments. Home to 400,000 trees and more than a hundred animal species, this place is perfect for picnics and leisurely strolls while enjoying the view of gently fluttering cherry blossoms. 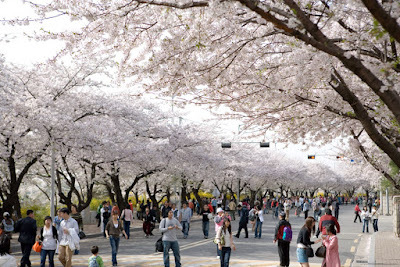 One of the city's most visited attractions, Namsan Park is perhaps the best place in Seoul to view the cherry blossoms. 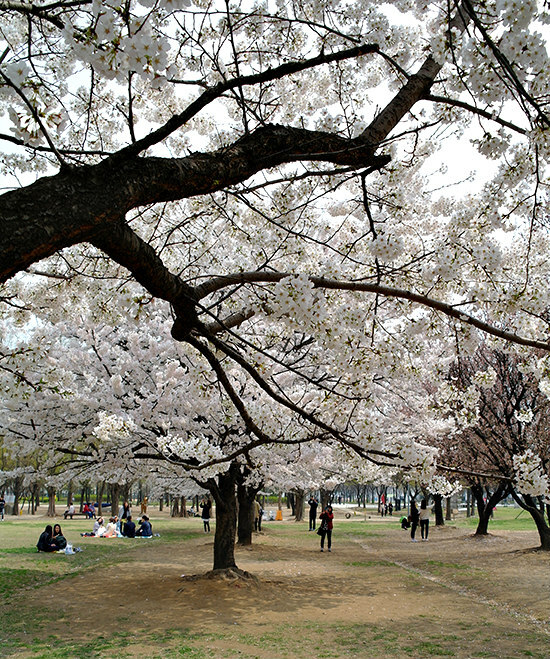 The park has a Cherry Blossom Path, which is the longest avenue of cherry trees anywhere in Seoul, and looks spectacular in full bloom. 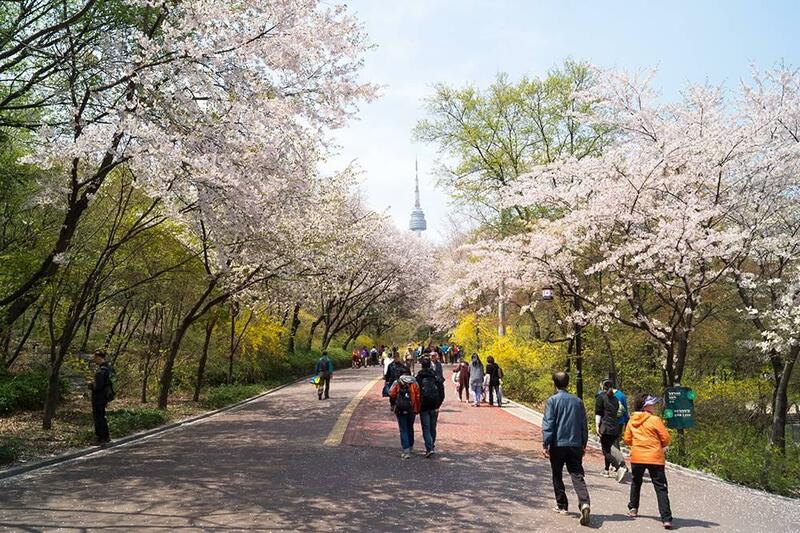 The annual Namsan Cherry Blossom Festival takes place during this time of the year, when more than 2000 cherry trees will be at its pinkest. During the festival, the mountain will be adorned with spectacular lighting, while street performances and various activities will keep tourists and guests entertained. Seokchon, the artificial lake that surrounds Lotte World, is another great place to enjoy the cherry blossoms. During the spring, the lake boasts of a splendid view of cherry blossoms and about 300,000 wild flowers that bloom altogether. The annual Seokchon Lake Cherry Blossom Festival takes place here, and will most likely commence during the first or second week of April. The festival will showcase exhibitions, street performances, and other activities for tourists and locals alike. Yeouido Park is a large recreational area located on Yeouido Island in the central part of Seoul. It is one of the most popular parks along Han River, and is easily accessible by public transportation. One of the must-see areas in this park is Yunjunro Street, located behind the National Assembly Building. This place is famous for having the loveliest cherry blossom street in Seoul. Cherry blossom trees, aged 30 to 40 years old, line up for about 6 kilometers, and is the highlight of the annual Yeongdeungpo Yeouido Spring Flower Festival. Now I'm hoping that the cherry trees will still be in bloom by the time we arrive. They say the cherry blossoms are at its peak during the first and second week of April, but I won't be flying back to Seoul until the end of the month. Fingers crossed that I will get to see these lovelies in bloom! Beautiful landmarks! I would love to visit South Korea one day. My husband works with a lady that goes every year and I love seeing her pictures. Thank you for the awesome list. I've never seen Cherry Blossoms up close. They are so beautiful and breathtaking too! Oh I really want to go there and find Cherry Blossoms then take a picture! It is so cool and attractive. Spring is such a wonderful season to travel & South Korea is one of those amazing destinations I would like to explore sometime soon. The Children's Grand Park & the Seokchon Lake looks amazing among all those you have listed here. I have never seen cherry trees up close. Springtime is such a beautiful time of year for viewing nature. I would love to picnic under one of these big tress and take in all the different animals. My little boys would also enjoy this. I would love to see cherry blossoms. It's so nice to know where to find them during this season in Korea. Am taking notes of these places and hope to catch them next week, if my schedule permits. Expecting the crowd will be overflowing this season. Absolutely beautiful! Korea is totally in our bucket list but we would like to go their in the winter. We want to experience snow and wear winter clothes, and my kids want to play in the snow ^_^. A tour in Seoul is my dream for my family. Next to Fiji and Alaska. Places my heart longs for most. Browsing photos of these places from the internet takes up a lot of my free time. Seoul is one of the places I want to visit in my lifetime. I hope someday to visit those lovely historical palaces and places. As for cherry blossoms, I wanted to see those in Japan. I don't know why, but somehow I want to see the cherry blossoms in Japan. But if I am lucky enough, I don't mind seeing those in Seoul. They look gorgeous still. Beautiful photos! I hope someday I could visit Korea, I have a Korean friend and she's in Seoul. I love cherry blossoms and would love to pose with them in the future. Those beautiful trees and the cherry blossoms one thing i'd like to see someday, so nice to look at them and so fortunate to those people who live in a place where cherry blossoms do grow.